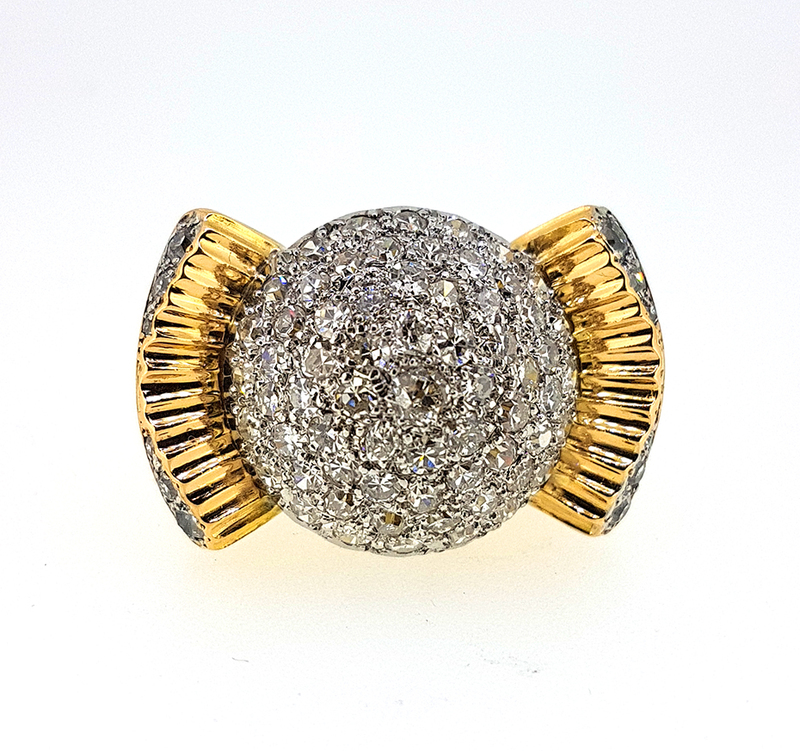 Item description: * An absolutely magnificent and important antique Cartier circa 1935-1940 late Art Deco Retro style bow cocktail ring with 4.10 carats of diamonds. 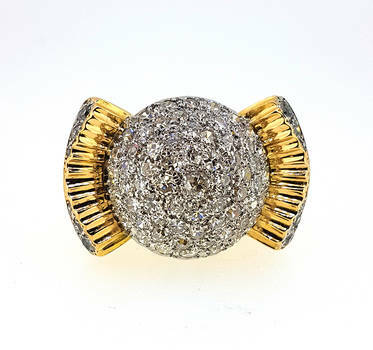 The ring's design resembles a stylized large bow with a very large diamond circle platinum center fully paved with 65 round transitional brilliant and old European cut diamonds. All diamonds are set into a platinum setting and have diameters in the 2.5-3.0mm range and average brightly sparkling E-F white color and VS1 clarity. Each edge of the bow ribbon has an additional garnish of another 12 round diamonds of smaller graduated sizes. 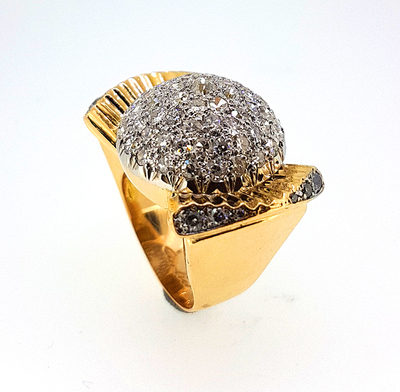 All 77 diamonds have an estimated total diamond weight of about 4.10 carats. 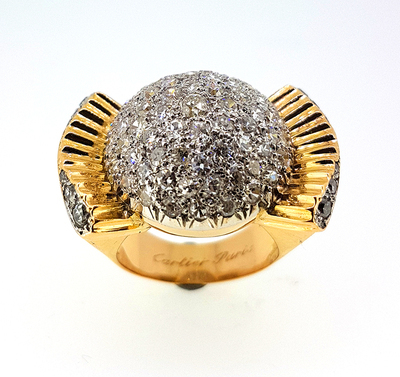 This exceptional Cartier Retro Cocktail diamond ring has a large top measuring approximately 30mm (1.18") across and 20mm (0.80") wide. 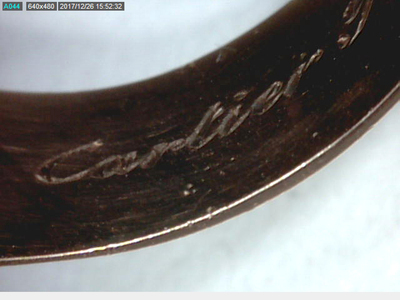 The ring is signed Cartier Paris on the inside of the shank, as well as numbered 2517 with a Cartier inventory number. 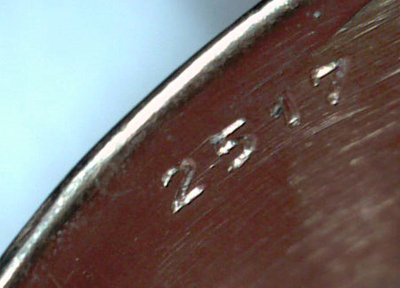 Additionally, on the outside bottom of the shank, the rink bears a Cartier maker's mark and a hallmark for 18 karat yellow gold. 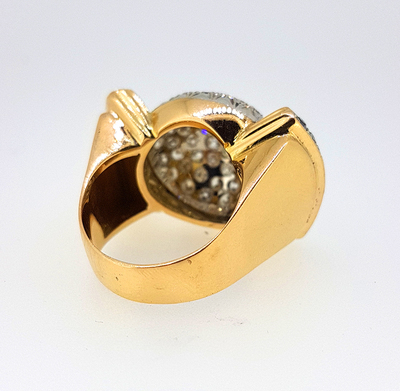 The ring size is 57 (UK size Q / US size 8), but can be resized. 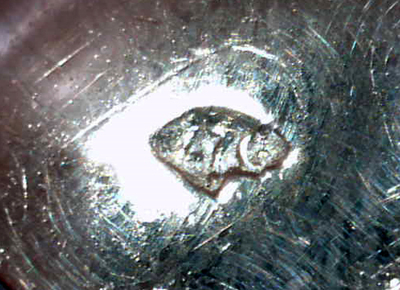 Gross weight is a heavy 21.3 grams of 18K gold and platinum. 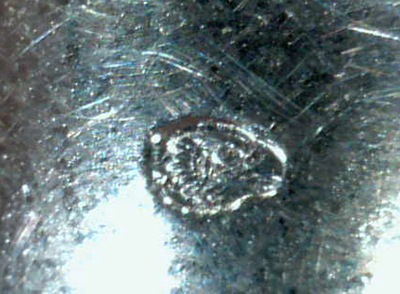 The piece is in a very good condition with some minor wear consistent with age. We can polish it upon additional request. 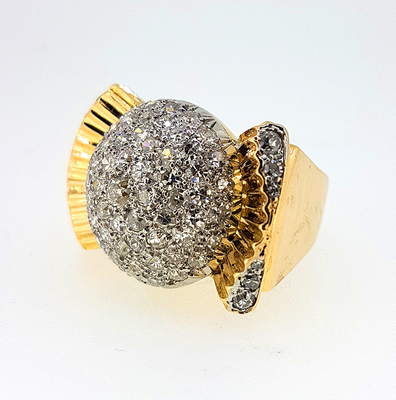 Absolutely scarce antique collector jewelry piece and one of the very rare 1930s - 1940s Art Deco Retro Cartier diamond rings and jewels.